I had been into Neudorf a couple of times, but never in the winter. On the main street there are a lot of vacant spaces. My grandmother told me once that when the railroad bypassed them and came to Jericho instead, a lot of families put their buildings up on wagons and hauled them up to Jericho. Bought a lot and set them down. There’s a bar that I thought I remember being open when I was young. 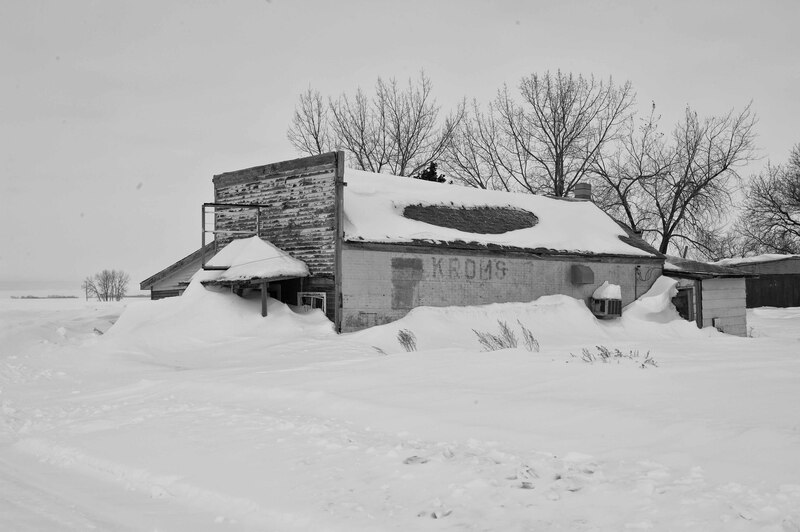 The snow drifts were piled up right over its door, covering its windows. There was another building, a store, that looked as though it had had its front windows smashed out, bit by bit over time, and each time they nailed a new piece of scrap lumber across wherever the hole was. It’s a pretty motley patchwork of old plywood, unmatched shutters, unpainted planks, and even most of a door nailed up over the windows. There used to be a schoolhouse too. I remember in high school, some guys at a party one night got pretty drunk, wanted to go burn it down. They wanted me to go, and the only thing that saved me was that Laura wanted me to get her home. They all got nailed on the way down there for drinking and driving. They didn’t really do anything serious to you then, but a lot of those kids caught hell at home. So we didn’t burn it down. But later, when I was off at college, somebody else did. It was kind of a cool old structure. Somebody had talked about making it some kind of a museum, a pioneer museum. They said you could make a pretty cool museum out of that town. But a lot of it is gone, now. I drove in there and you couldn’t get to most of the town. The snow was plowed up to Ed Armbrust’s house and one other. There’s a whole other block further away from the highway where the snow was high in drifts. I got out and walked a ways down that street. There was a house that I remember looking kind of stately when I was growing up. It had dormers in its second story roof, and a front door with some nicely cut glass panes. The door was gone. I peeked in, and you could see that the floor had caved in. The fridge, the stove, all the stuff in the kitchen had topped down through the hole into the basement. Junk, papers, pieces of moldy carpet were scattered all over. It was like they had turned the house into a trash can. It’s practically a ghost town. I wonder what it’s like to live in a place like that, if you’re Ed Armbrust, or whoever lives in the other house. Jeez, it could be just two or three people living in the whole town. But what would it be like to have neighbors, or not neighbors, but a house where all of the things in it are crashing through the floor into the basement. Where eventually the roof will cave over all of it. Or some stupid high school kids will come and set it on fire, because they think it’s fun to see something that was nice once burn to coals. It’s becoming a ghost town, but it’s almost as though the people in it are ghosts already.